« After Resignation, Who Leads Mural Program? On Tuesday, Aug. 2, Ann Arbor residents will elect the Democratic Party city council nominees for the November ballot in three of the city’s five wards. The council consists of two representatives from each ward plus the mayor, all of whom serve two-year terms. Each year, one of the two seats in each ward stands for election. This year is an off year for the position of mayor. 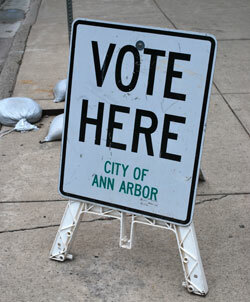 File photo of sign marking a polling location. For readers who are uncertain about which ward they live in or where their polling place is located, type in an address on the My Property page of the city of Ann Arbor’s website, and click on the Voter tab. Polls are open on Tuesday from 7 a.m. until 8 p.m. In Ward 2, incumbent Stephen Rapundalo is challenged by Tim Hull. No Republican candidate filed for Ward 2. So unless an independent candidate submits qualifying petitions by Aug. 15, the only choice on the November ballot will be either Rapundalo or Hull. In Ward 3, incumbent Stephen Kunselman faces challenges from Ingrid Ault and Marwan Issa. Whoever wins the three-way race will appear on the November ballot with Republican David Parker. In Ward 5, incumbent Mike Anglin faces a challenge from Neal Elyakin. Either Anglin or Elyakin will appear on the November ballot alongside Republican Stuart Berry. In Ward 1, incumbent Sabra Briere was not challenged for the Democratic nomination. So unless an independent candidate files by the Aug. 15 deadline, hers will be the only name on the ballot in November. In Ward 4, incumbent Marcia Higgins was not challenged for the Democratic nomination, but will appear on the November ballot alongside Republican Eric Scheie. Chronicle coverage of the Democratic city council primaries includes two candidate forums per ward, plus an analysis of each incumbent’s past election performance, broken down by precinct, as well as a statistical and geographic overview of campaign contributions. After the jump, we provide individual links to previous Chronicle coverage of the candidates and other election-related articles. Ann Arbor Dems Primary: Two for Ward 2 – summary of remarks by Stephen Rapundalo and Tim Hull at a July 13 forum sponsored by the local League of Women Voters. Ann Arbor Ward 2: Democratic Primary 2011 – summary of remarks made by Stephen Rapundalo and Tim Hull at a June 11 Ann Arbor Democratic Party event hosted at the Ann Arbor Community Center on North Main Street. Ann Arbor Dems Primary: Three for Ward 3 – summary of remarks by Stephen Kunselman, Ingrid Ault and Marwan Issa at a July 12 town-hall style meeting at the Malletts Creek branch of the Ann Arbor District Library. Ann Arbor Ward 3: Democratic Primary 2011 – summary of remarks by Stephen Kunselman, Ingrid Ault and Marwan Issa at a June 11 Ann Arbor Democratic Party event hosted at the Ann Arbor Community Center on North Main Street. Ann Arbor Ward 5 Dems in 100 (Or So) Words – summary of remarks by Mike Anglin and Neal Elyakin at a July 13 forum sponsored by the League of Women Voters. Ann Arbor Ward 5: Democratic Primary 2011 – summary of remarks by Mike Anglin and Neal Elyakin at a June 11 Ann Arbor Democratic Party event hosted at the Ann Arbor Community Center on North Main Street. Ann Arbor Elections Past: Voting Patterns – a compilation of maps breaking down the performance of incumbents Stephen Rapundalo (Ward 2), Stephen Kunselman (Ward 3) and Mike Anglin (Ward 5) in their past city council elections. Democratic Primary 2011: Mapping Money – a statistical overview of contributions to candidate’s campaigns and maps plotting out where the contributions came from. My two cents: if you live in the Fifth Ward, check out Neal Elyakin’s website: [link] or give him a call at home (996-0476). I grew up down the street from the guy and I respect him a lot. He’s got a lot of energy and curiosity, works very hard, and enjoys thinking about city issues from all angles. There is no doubt in my mind that Neal will be an active and independent councilman, someone you can really get to know. Tomorrow is a big day for other reasons, but you can take your mind off of the boneheadedness of the U.S. Congress by voting in the Ann Arbor City Council primary. In his Blog, he implies that Palestinians are a myth, a fictitious people. What would his attitude be towards Palestinian Ann Arborites? The Ann Arbor City Council will never consider any policy remotely affecting the state of Israel. The idea that Neal will have some antipathy toward Palestinians or Arabs in Ann Arbor is ridiculous. Is anyone aware of other local groups that conduct candidate surveys? If so, it would be nice to see them aggregated.